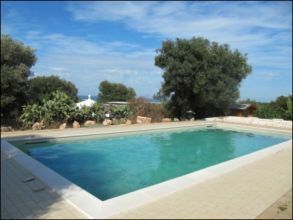 On sale in the Carovigno, villa with swimming pool overlooking the sea in a Mediterranean style, made up of living-dining room with large windows on the outside from where you can admire the sea, kitchen, utility room, four bedrooms and two bathrooms. The villa is equipped with air conditioning-humidifiers livable both in winter and in summer and electric gate. The land is about 7000 square meters planted with olive trees, fruit trees and garden with lawn and ornamental plants. The pool measures 6 x 12 and has a unique and wonderful sea views, where you can relax enjoying the beauty of the area. From the terrace of the villa, the view overlooking the sea and become a unique and wonderful where sky and sea merge into a single reality. The villa is located in a quiet and reserved, in direct contact with nature.